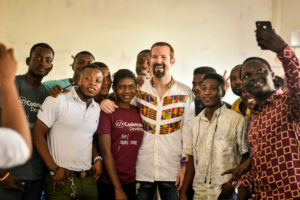 Gary Whitehill, the founder of Entrepreneur Week, one of the largest global networks for business owners and a founding global advisor of the Dell Entrepreneur-in-Residence (EIR) Program visited Codetrain to inspire Ghana’s next top app developers. Gary gave an exciting speech to Codetrain’s community of young app developers on topics such as good values, community building, collaboration, economic empowerment in Africa using technology and personal well-being. He inspired them to employ their knowledge and skills to solve social problems to create an economic impact. Codetrain’s vision is to provide a holistic training – which includes practical projects, mentorship from successful developers and thought leaders, and the soft skills required to be successful professionals or entrepreneurs – to Ghana’s youth who are aspiring to be professional app developers to support the digitization of the country’s economy, and to create wealth as well as jobs. Codetrain offers practical skills training in mobile and web app development to young people in Ghana and assists them to find internship and job opportunities.